Along the network of Indian paths, travelers frequently encountered other people, stopped to converse, and shared news of recent events or the fruits of a recent hunt. In wartime, trails could be crowded with warriors, both Indian and European, intent on violence. In peacetime, however, hunters, traders, messengers, diplomats, and those visiting relatives and friends used the paths. Hospitality and fellowship governed life on the trail during such times. Food could be easily found at the many Indian villages and cabins located along the trails or by hunting the abundant game of the forests. In an extensive study, historian Paul A.W. Wallace (1891-1967) identified 131 distinct Indian trails in Pennsylvania. 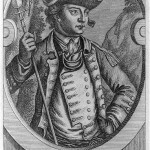 The Allegheny Path, a primary trail leading out of the Delaware Valley, ran from the future location of Allegheny Avenue in Philadelphia, through Paoli to Harrisburg, across the Susquehanna and into Carlisle, where it forked into the Raystown and Frankstown paths. 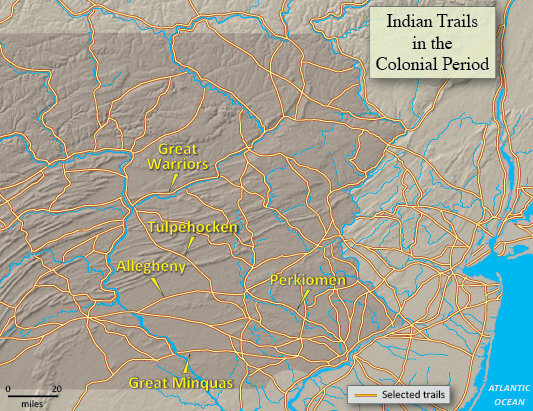 The Perkiomen Path ran from Philadelphia to Norristown, crossed Perkiomen Creek, and extended into Reading, where it joined the Allegheny Path. Map sources: The Encyclopedia of Greater Philadelphia essay by Matthew A. Zimmerman, Department of History and Political Science at Middle Georgia State University; Indians in Pennsylvania; Mapping New Jersey, An Evolving Landscape. Map by Michael Siegel, Department of Geography, Rutgers University. Posted by Don Groff on March 9, 2016 at 10:01 am. Bookmark the permalink. Follow any comments here with the RSS feed for this post. Trackbacks are closed, but you can post a comment.